A driver in Florida was shocked to discover an owl trapped in the grille of her four wheel drive after hitting the bird the previous day. Florida motorist Sonji Coney Williams was alarmed to find the feathery stowaway trapped in her radiator after being flagged down in a Miami car park. Passersby spotted the Great Horned Owl’s yellow eyes peering through the grille of the SUV. It is thought the bird became lodged after being hit by the vehicle 24 hours previously. 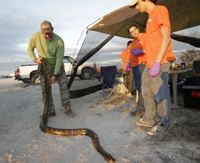 A public hunt for Burmese pythons in the Everglades yielded 68 of the invasive snakes, the longest measuring more than 14 feet long, Florida wildlife officials said Saturday (February 16, 2013). That might not seem like a success, considering roughly 1,600 people signed up for the state-sponsored Python Challenge that ended Sunday, but Florida Fish and Wildlife Conservation Commission officials said the hunt may have prevented thousands more pythons from being born in the Everglades. Female pythons can as many as 100 eggs at a time. Researchers say pythons are eating their way through the Everglades, decimating populations of native mammals. The snakes can grow more than 20 feet in length, and they have no predators, other than the humans desperately trying to control their population. Ruben Ramirez of Miami and his Florida Python Hunters team won $1,500 for bagging 18 pythons, the most caught by any of the permit holders. He also won prizes for bringing in the two longest snakes to be caught by any of the permit holders. Both those snakes stretched longer than 10 feet. Brian Barrows of Fort Myers led the competition for amateur hunters, winning $1,500 for harvesting six snakes. His friend, Paul Shannon of Lehigh Acres, won $1,000 for catching a python measuring 14 feet 3 inches long. The other snakes caught by Barrow and Shannon’s team ranged from 7 feet to 9 feet long. On six separate days during the monthlong hunt, they pointed Shannon’s airboat toward remote tree islands, looking for snakes sunning themselves on dry land. Increasing the number of human python hunters may not be Florida’s only option in the ongoing effort to control the snake population. Researchers at Auburn University have been exploring the use of dogs to sniff out pythons. In a controlled experiment that sent humans and dogs in search of pythons outfitted with radio transmitters, Labrador retrievers previously trained to sniff for bombs did a better job of finding all the snakes, even the smallest ones that were just a foot long, said Christina Romagosa of Auburn’s School of Forestry and Wildlife Sciences. 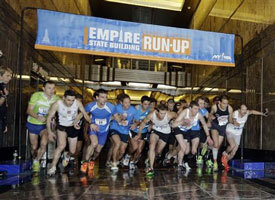 Over 600 competitors from around the world entered the annual race, which took place on February 6th this year. The race consists of racing up 86 floors, 1,576 steps, and 1,050 feet from the lobby to the iconic 86th floor Observatory. Mark Bourne of Australia won for the first time with a time of 10 minutes, 12 seconds. Fellow Australian Suzy Walsham won the women’s division in 12 minutes, 05 seconds – the fourth time she’s won the race, tying the record for most wins by a woman. From London’s Daily Telegraph and The Associated Press.